For a fighter who stumbled out to a 3-4-2 career start and hovered around—and often below—the .500 mark for the first three years of his career, Robert Talarek has shown a special kind of mental toughness in and out of the ring. The journeyman middleweight and full-time miner showed something completely different in his latest ring adventure, fittingly on his 6th year anniversary in the pro ranks and one that will find itself deep in discussion for the best fights of the year and of the decade. 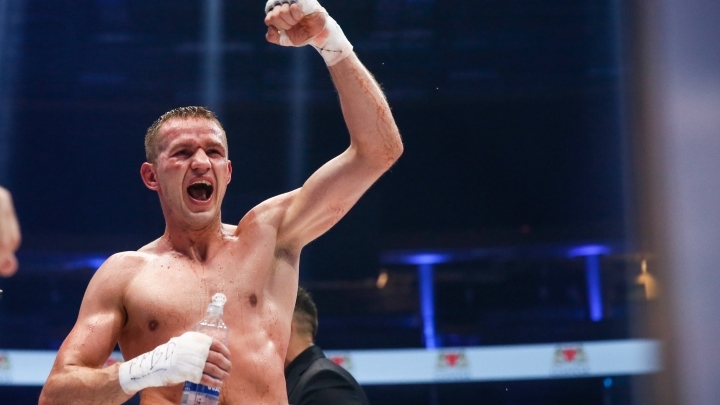 In an instant classic and leading Fight of the Year candidate, Talarek somehow survived four knockdowns in less than 5 ½ minutes to score six of his own in stopping countryman Patryk Szymanski in five rounds Saturday evening in Katowice, Poland. The unbelievable 10-knockdown affair ended with the heavily-favored Szymanski deemed unfit to continue by referee Robert Gortat at 1:45 of round five, perhaps the only time in the night that Talarek could breathe a sigh of relief. “Of course, there were moments of doubt,” Talerek (24-13-2, 16KOs) confessed to Mateusz Borek of Polsat Sport, which aired the bout live. “I knew that Szymanski was a good technician and it would be very difficult at the beginning. Talarek is a hardened middleweight all too familiar with reality. Still, few can be expected to overcome the type of adversity he faced on Saturday, when separate right hand shots had him down twice inside of the first 63 seconds of a free-swinging shootout. Two more trips to the canvas would come of Talarek by the end of the second round, but by at which point he’d score one of his own. A right hand shot had Szymanski on the deck midway through round two, only to rise and violently send his countryman to the canvas with a booming overhand right forcing Talarek’s leg to fold under him on the way down. An ensuing knockdown barely 20 seconds later courtesy of consecutive right hands was Szymanski’s last great moment in the fight and perhaps his career. The 25-year old—who’d been stopped by French spoiler Fouad El Massoudi in four rounds last October—claimed beforehand that he would retire if he couldn’t return to the win column. That announcement would come seven ring minutes and five more knockdowns later as Talarek permanently seized control at the start of round three. The veteran middleweight—who turns 36 in June—scored two knockdowns each in rounds three and four, almost entirely comprised of right hands. Talarek closed the show in round five, smashing a left hook across Szymanski’s grill along the ropes before a right hand forced him to a knee. With blood pouring out from above his eye, the battered boxer beat the count but was clearly in no condition to continue. Long before he was asked to overcome four knockdowns to win a prizefight, many would’ve argued that Talarek wasn’t fit to even make it to this point in his career. His perseverance since turning pro on this day six years ago is proof positive that you don’t have to quit your day job in order to survive another profession that you love.